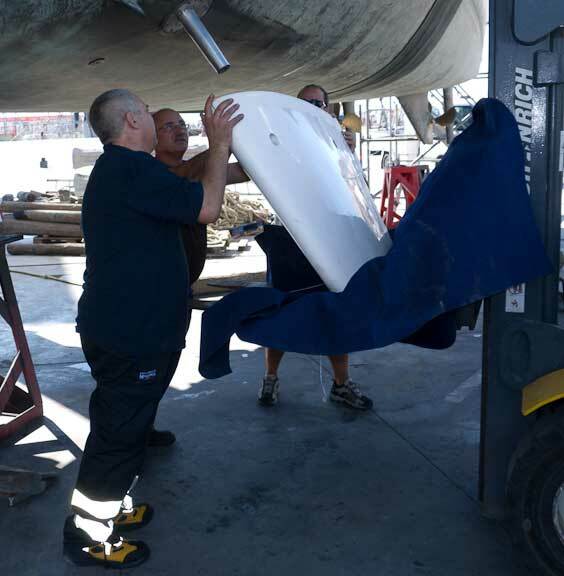 We’ve had a four hour hang in the slings in Palma to replace our damaged stabilizer fin. We are not happy with what we found. 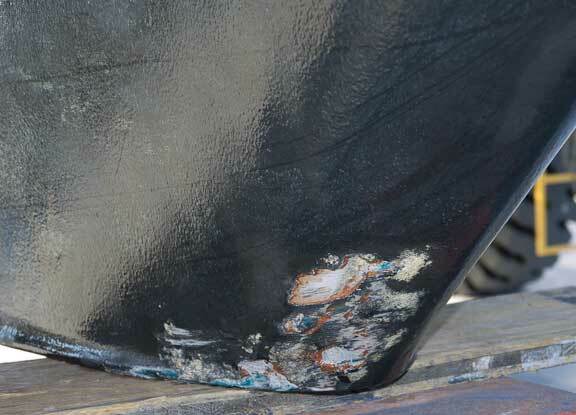 The leading edge of the keel, which hit just before the port stabilizer. Note that the microballoon fairing on the keel is dinged, but the undercoat is still intact. This is a good indicator of the probable loads, which were light. Before we get into what we think of the fin engineering, let us say that we have been very pleased with the NAIAD performance and service. There have been some hydraulic QC issues on all the boats so far, but the system, once operating, has been excellent. We have discussed the comments which follow with them and they have their reasons – right or wrong – for doing things a certain way. They are not going to change what they say works in fin construction for one small customer. Our logic in cruising yacht design is that mistakes happen. People run aground, hit logs, bang into ice. This is part of cruising. We want to be able to make modest mistakes – such as the one which caused this damage – without having to visit a boat yard. Hence our keels are designed to four times the ABS rule, rudders to twice. Two things immediately draw your attention to this stainless insert formerly molded into the fin. The first is the lack of foam adhesion to the stainless. The shearing on the foam surface on the other side is what we would expect everywhere. The bond line between foam and its substrate, properly done, is normally the strongest point in the foam. The second item is the size of the stainless insert relative to the fin. This is maybe 1/12th the fin’s area. Even if the foam had not released it would have quickly sheared off this small area. The stabilizer tip is frangible, absorbs energy on impact, and fails leaving the majority of the stabilizer behind. The balance of the stabilizer foil fails before it transfers damaging load to the stabilizer shaft. 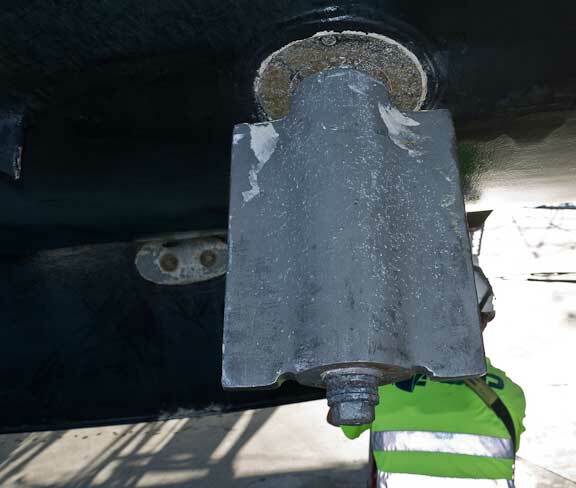 The shaft fails before it damages the bearing carriers and attachment points to the hull. 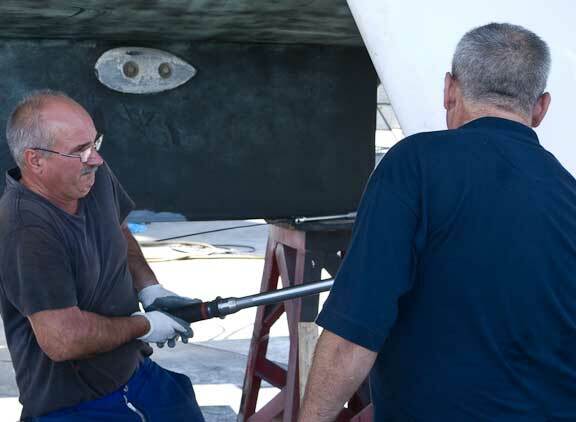 If this were a steering rudder – it acts just like one – you would have a framework of spar and ribs (wing style), extending down from the shaft insert. The bottom third would be weaker than the upper portions. The foam would be flexible, like Airex, and the laminate tapered in reinforcement, with a resin used that had elongation properties that matched the reinforcing fabric. This design might add 50% to the cost of the stabilizers, maybe even double the price, but if done this way we would have just avoided the haul out. 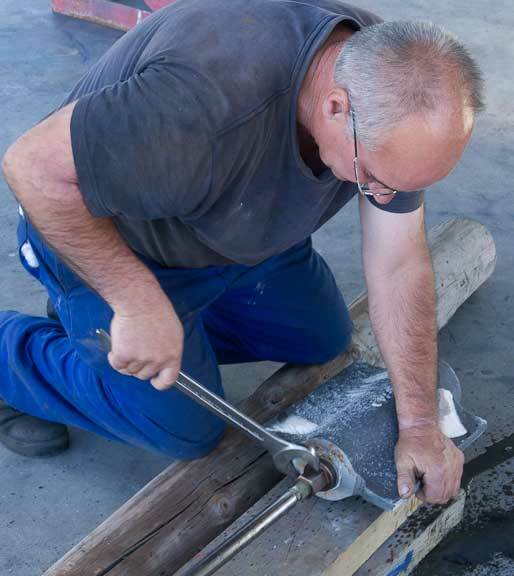 One of the mechanics, removing the hydraulic decoupling tool from the insert, gives some scale to things. Installing a big stabilizer, weighing close to 400 pounds/185kg, requires a fork lift, three strong men, and care. The final step, using a huge torque wrench to apply the appropriate pressure to the bolt which holds the fin onto the shaft. You could say that having covered in excess of 45,000 miles without incident, including debris strewn waters in British Columbia and Alaska, and then dealing with ice in Greenland and Svalbard, would qualify NAIAD for a pass on this. And it may be that their average client’s boat is so weak as to make this type of failure mode mandatory. Then to, it was an error on our part that lead to this discussion. But we think they can do better. And we’d much prefer to have them supply us fins engineered on the principles outlined above rather than having to design and build our own. This entry was posted on Wednesday, September 15th, 2010 at 5:14 pm and is filed under Dashew Logs. Both comments and pings are currently closed. The downside as I see it is that any increase in the structural strength of the fin increases the risk of transferring damaging forces to the shaft and the hull which seem like a far more dangerous place to have stresses. You compare it to a steering rudder but I find the comparison is odd. You’ve said yourselves that the boats hull has quite a good ride quality even without stabilisers so in essence arent the stabilisers are largely there for comfort? therefore the need for bombproof engineering is far less than for the rudder. 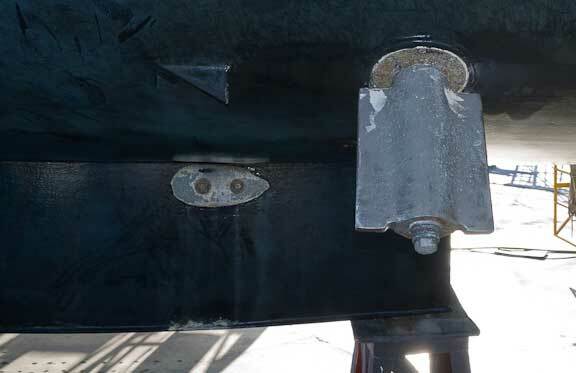 I agree the insert to fin area is pretty light on, but in terms of the fin itself a sacrificial failure mode which releases the entire fin well before any risk of shaft or hull damage seems beneficial to me. Youve been doing this a lot longer than I so would be keen to try and understand a little more your reasoning for your wish list. If the FPB were left to dry out at low tide, would the fins handle the load? 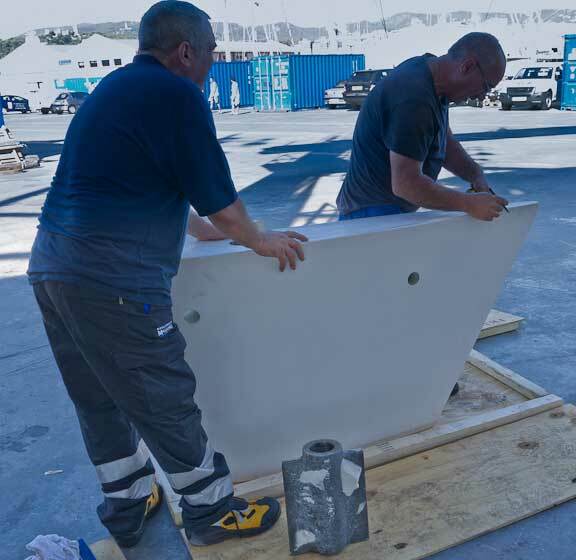 Would fins designed to your specifications handle the load? Thanks for the very interesting followup. I was wondering whether intentionally putting a boat on the beach, as the FPB64 can be, would potentially affect the bond between the outer foam and the stainless insert in the stabiliser fin which was touching the ground? Thanks for sharing this experience and all your hard work on maintaining this site. I consider the stabilizers as spade rudders. They don’t have the advantage of a skeg and are thus high performing, but delicate extrusions. I think this is the price to pay. Even if NAIAD constructed the fin as per your request, you would still be in the yard and out of pocket for a new one, me thinks. Could the FPB ‘dry out’ without endangering the stabilizer fins? Was the decision to install over sized fins partly to blame? And finally, did you trial the (NAIAD) recommended fin size to see if they provided the desired performance? We’ve got a series of questions and or comments on this blog so we will answer them all in one go. 1-We could easily get the boat back to the States from here on one fin. But, if we run into some unpleasant weather, we are going to be more comfortable with both. 2-Our systems and design logic is predicated on the boat being used where haul out services are not available, with the ability to keep cruising regardless of almost any issue. Certainly we’d not turn back from the loss stabs on a passage. However, we consider the present stabs a weak link of sorts and now will be more nervous with debris in the water and in ice. We prefer it otherwise. 3-The engineering approach outlined would still protect the hull, which in our case is much stronger with its localized stiffeners than the shaft. Losing the outer portion of the fin could probably not be detected in motion, and there is a good case that the damage would be limited to a bit of crushed foam. 4-If the FPB64 us dried out on sand or mud, the stabs should be fine. We are guessing they have similar sized inserts and have been told the foam and laminate are improved – and they are a third smaller. 5-After significant time with CFD one of the old timers at NAIAD said “install the biggest fins you can” which is what we did. If the hull is built of steel or aluminum surely the hull can take a minor debris hit and survive without a fin replacement everytime. Pushing steel workboats through soft sand or soft mud to get the materials to oil rig on time without any damage to keel coolers the niaf fins seem to me to be tender and to sacrificial. They should be strengthened and designed for the hull material used. 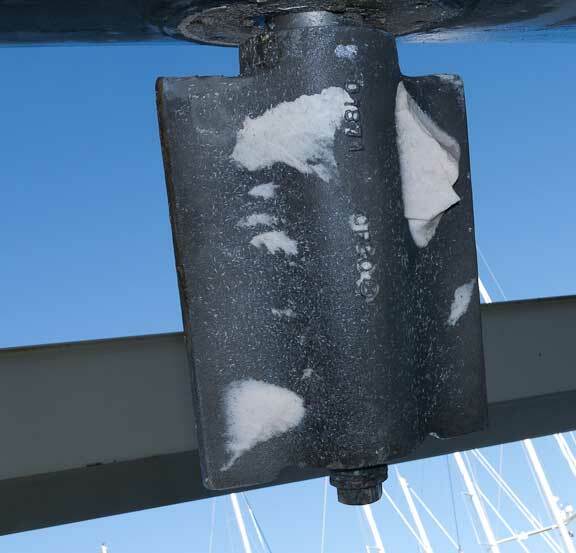 Keels and rudders in time have surely taken heavier hits or groundings on steel or aluminum vessels without serious hull or rudder damage. Quit the wimpy attitude I want a stronger fin as a requesting customer.